One of the great things about doing shadow puppetry at home or in the classroom is that you don’t need fancy tools and supplies. 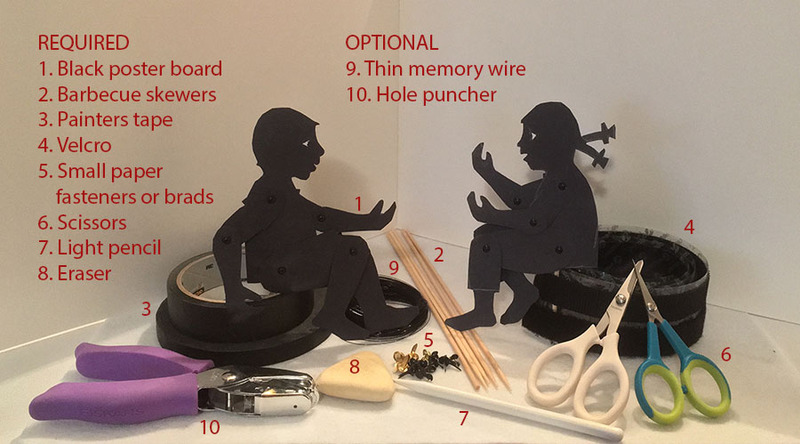 You can make a desktop theater of a cardboard box and parchment or tracing paper, and cut puppets out of the thin cereal boxes. Ordering materials through the Amazon links provided below will allow me to receive a small kickback if you make a purchase. All supplies listed can also be purchased through your local stores. Black poster board. I recommend the dimensions 28 x 32″, which is available in single sheets in craft stores. The thickness should ideally be thicker than cardstock. Make sure the paper has some texture and isn’t too smooth, because that will not allow drawing.